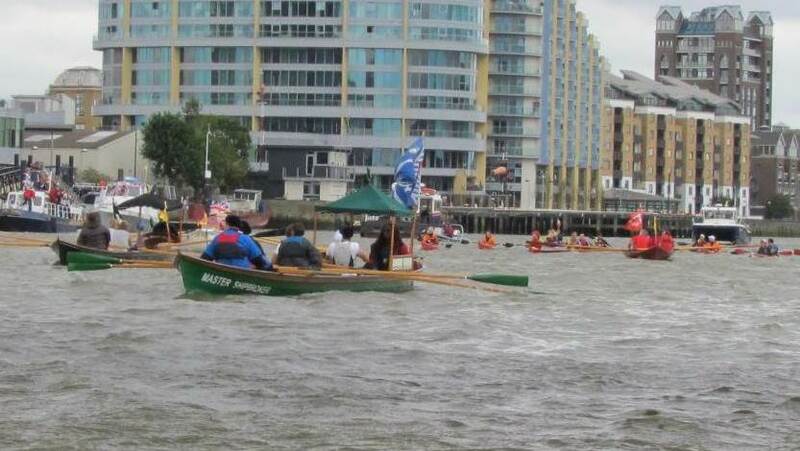 The annual Thames Festival celebrates everything special about this great waterway, but this year something special happened; the Port of London Authority hosted a flotilla of boats – both manned and powered through the heart of the capital. 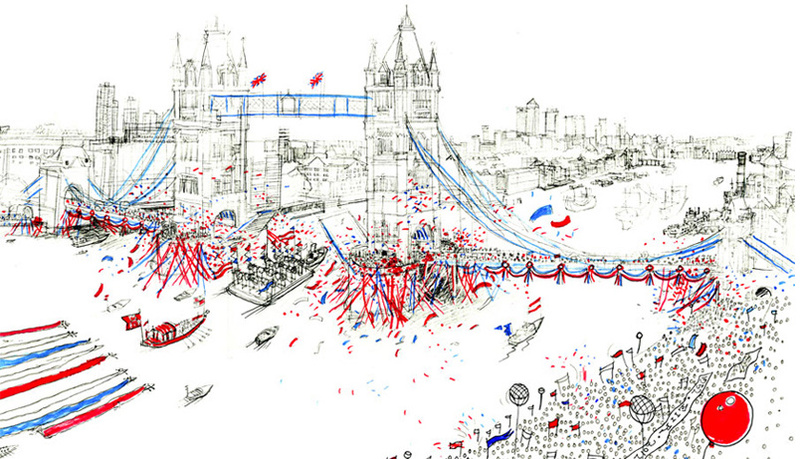 Boats with bells, whistles, trumpets, Dixie and brass bands heralded the arrival of the 100+ flotilla and called the people to the riverside to watch the precession go by, which included a massive water-jet boat, spraying high into the air. In truth, despite being impressive in its own way – this was nothing but a watered-down rehearsal for The Queen’s Diamond Jubilee Pageant next year when a thousand boats will be loaded with well-wishers and decorated with flags and streamers to pay tribute to Her Majesty in celebration of sixty years as our monarch. This is the second rehearsal that I’ve been lucky enough to help out with – the last one was specifically a kayak rehearsal – but this time, all the pieces were put together, to see how it would pan out on the big day. 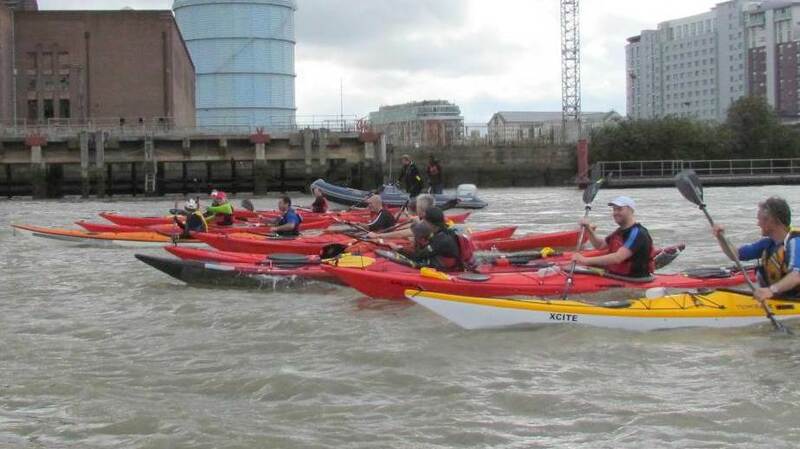 Of the 11 kayaks taking part in the Thames Festival flotilla, an impressive eight of them were Chelsea Kayak Club members with a couple of people from Tower Hamlets and KayakingLondon making up the numbers. 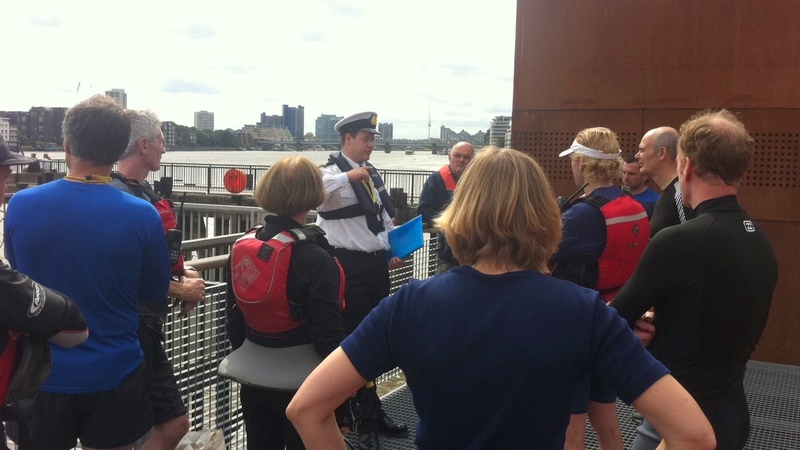 We met at Cremorne Riverside early to receive a briefing from Darren Knight, PLA’s Operations Coordinator, then jumped in the boats and paddled up river to the Hurlingham Yacht Club’s Broomhouse Pier – which was our designated muster point. We were to join at the front of the precession, after the main ‘Belfry Barge’ that chimed its way towards the sea and after the rowing boats – which to my surprise weren’t sculling sixes or eights but old fashioned cutters – with little canopies! When we finally got started it soon became obvious that these pretty-but-bulky boats didn’t have the manoeuvrability to keep tight formation and our nimble solo sea kayaks soon shifted ahead to follow the marker vessel which was cruising at a comfortable 6 knots over ground. Thankfully, the lessons learnt from the last rehearsal had been headed and the longer delay between high-tide and starting out meant that keeping the 6 knot speed was pretty easy, thanks to the ebbing current. So much so, that we were even able to orchestrate some off-the-cuff synchronised paddling moves – including high speed end-boat crossovers to mix up our neat line of boats bobbing along abreast of each other. It was with big smiles on all of our faces that we first encountered the gathering crowds in the centre of town. All along the South Bank; bands, stalls and performers were entertaining Londoners and, as we followed the Belfry under the bridges we waved back to the people, whooped and spun our paddles to make them cheer. Although in honesty I think we were only small-fry compared to bigger boats that were trailing behind us. The majority of people we saw were gathered around Tate Modern and on the Millennium Bridge, just as the river was getting that much choppier and chunkier to paddle – but even so, we held our formations and waved to the watchers. It was shortly after that we heard the cries of “Rescue, Rescue” from the fast approaching rowing boats behind, as they tried to get the attention of the safety RIBs to either side of our little collection of kayaks. It transpired that a small three man open canoe, which was part of the ‘rowing’ squad had not been so lucky with the large breaking waves under London Bridge and the paddlers were now swimming in the Thames – oops. It goes to show how easily the waves can pick up on this stretch of tideway and local knowledge and experience, as well as appropriate boats are a must. It wouldn’t be seemly to have people in the water (or falling under HMS Belfast) when The Queen is in attendance next year. Being regulars on this river, we all knew what to expect and maintained our tight group as we passed beneath Tower Bridge and onwards to our get out at Shadwell Basin. We started our paddle-proper by the London Helipad at Battersea and, over the course of an hour covered 11km – or so I was told by the man with the GPS as we sat in the Prospect of Whitby drinking a couple of pints to another great day sea kayaking and to being part of the London celebrations. 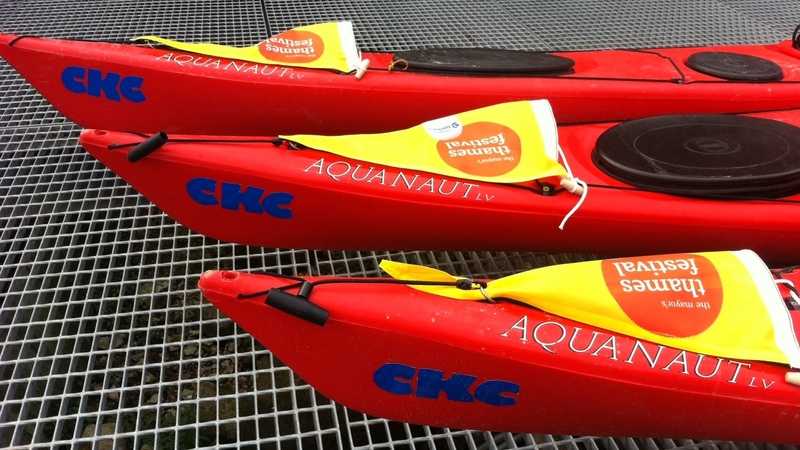 For The Queen’s Thames Diamond Jubilee Pageant they’re hoping to have ten times the number of sea kayaks taking part in the flotilla on 3 June 2012 – as yet, none of these spaces have been allocated. Anyone who wants to take part needs to apply via the website before 31 October to be in with a chance of being selected. It should be an awesome day and, one that will only come about once, so make sure you send off your details asap.